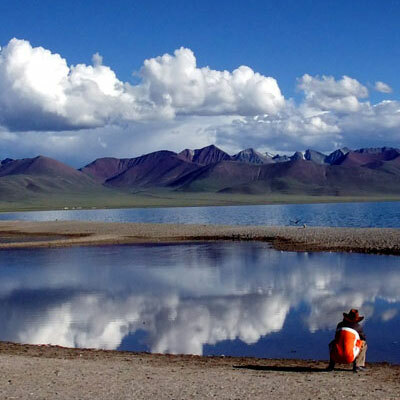 Tibet mountain biking tour is a thrilling journey to the highest plateau in the world. This is a demanding and adventure trip into a dry and barren land will lead us on a mind-blowing mountain biking experience from Lhasa to Kathmandu with most of the surrounding attractions. Tibet Mountain biking tour will follow the main route which runs westward, parallel to the magnificent Himalayan range. While riding a bike we will cross the several dramatic high passes and traverses a high arid plateau area. The ancient monastery towns and alpine settlements provide many wondrous sites throughout the journey. Tibet mountain biking tour will also take a detour away from the main route in order to reach the Pang La pass which offers the extensive views of the high Himalayas. 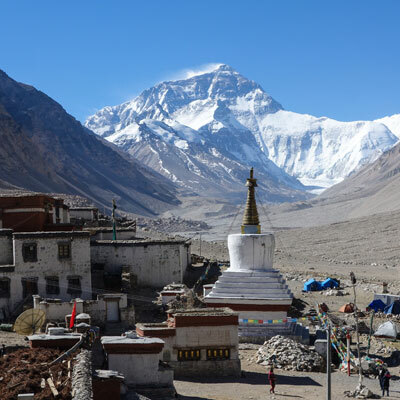 The main attraction of this journey is a breathtaking stop over at Everest base camp where we will spend a night at the base camp and gaze up at the Sheer monstrosity of Everest. Tibet mountain biking tour crosses one more pass when we reach the edge of the Tibetan Plateau as we cross the 5200m high Thang La, and start a stunning descent of almost 4600m, through the border town of Zhangmu, to the valley of the Bhote Kosi River in Nepal. The last day with scenic and easy 5 hour ride brings us back to medieval Kathmandu the capital city of Nepal where we end our Tibet mountain biking tour. and full board basis while camping. Day 01: Arrive in Lhasa, rest. Day 04: Riding around Lhasa city. Day 05: Lhasa to Chutsu. Day 06: Chutsu to Yamdrok Tso. Day 07: Yamdrok Tso to Ralung. Day 08: Ralung to Gyantse. Day 09: Gyantse to Shigatse. Day 10: Sightseeing in Shigatse and Rest. Day 11: Shigatse to Tso La. Day 12: Tso La to Lhatse. Day 13: Lhatse to Shegar. Day 14: Shegar to Pangla. Day 15: Pangla to Rungbuk. Day 16: Rest and exploration day at Rongbuk. Day 17: Rongbuk to Tingri. Day 18: Tingri to Thangla. Day 20: Thangla to Zhangmu. Day 21: Zhangmu to Kathmandu. Note: And/or if you wish to join this trip in Kathmandu you have to arrive 2 days prior to trip departure dates (But you need to provide us copy of your passport at least 25 days before the trip departure). Or if you wish to start in Lhasa, you can arrive Lhasa on the date mentioned above or earlier. Of course your dream will not come to true unless you visit Potala palace so that our guide will take you to Potala palace in the morning to explore some of the ancient quarters of the Dalai Lama. You will be prepared for astonishment as this grand palace has been around since the 17th century. Obviously, it is a vast building with much to explore. Evening come back to hotel for overnight stay. The amazing and first major pass will be encountered today as you cross Khamba La Pass. The ride will be slow to the pass. The views form the pass stretch out for miles and miles. You will be able to see numerous rivers and the turquoise waters of Yamdrok Lake. You will spend the overnight in tents below the lake after descending the pass. You will pack everything and head towards to your first stop the small town of Nagartse. You will visit the highly revered Samding Monastery. Lot of Tibetans trusts that this monastery is the home of the earthly incarnation of the goddess Dorje Pagmo then after you will climb second major pass, Karo La. It is an awe-inspiring site to see the massive glaciers rising nearly straight up from the road. Overnight will be spent below the pass in the tiny village of Ralung. Today is another easy and thrilling day as you cruise downhill to Gyantse. 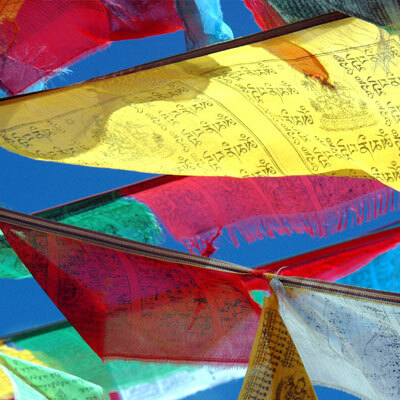 In Gyantse you will visit many historic sites. The sites start from ancient military forts to beautiful monasteries. Kumbum monastery, a large gold roofed stupa, has much to explore in its intricate buildings. Overnight will be spending in the comfortable hotel relaxing and enjoying the hot showers. Your next destination is Shigatse which is about 90 km far. You must get in your supporting vehicles only if you want to reach it by nightfall. Do not worry though. All of the beautiful sections of this stretch will be viewed on bicycle. In Shigatse, you will send the overnight at a comfortable hotel. Today you head towards your third major pass, Tso La. If is obvious that you must ride for nearly 115 km before you reach your final campsite before the pass. Overnight in tents. This day, from this challenging pass you are rewarded with your first views of Everest in the distance. Overnight will be spent in the small town of Lhatse at guest house. Today also you will cross another pass, Gyamtso La. The night will be spent in Shegar which is only a few kilometers away from the main road and our path to Rongbuk valley. Overnight at guest house. Pangla to Rongbuk, the route splits off to the south as you encounter Phadruchi, a decently sized town after the pass. Obviously, the majority of today's ride will be flat as you head toward Rongbuk. 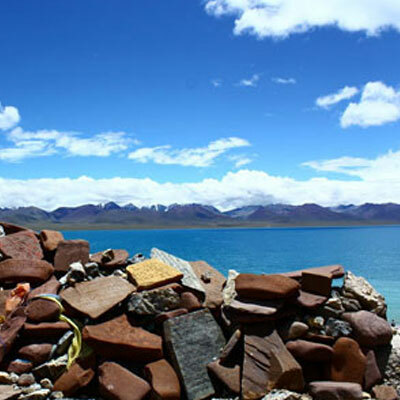 Definitely, you must climb a steep 10 kilometers before you reach Rongbuk Monastery. Absolutely, it will be such a relief to see Mt. Everest comes into view as we end this long day. Overnight at a guest house. 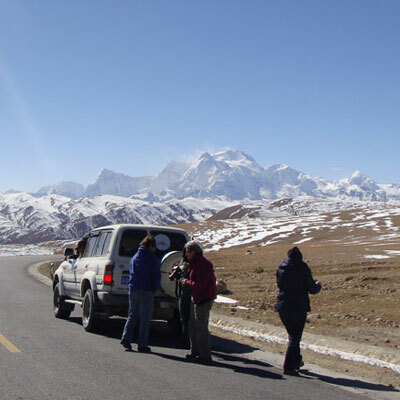 Today you will need more rest as it is the sightseeing day in Rongbuk. 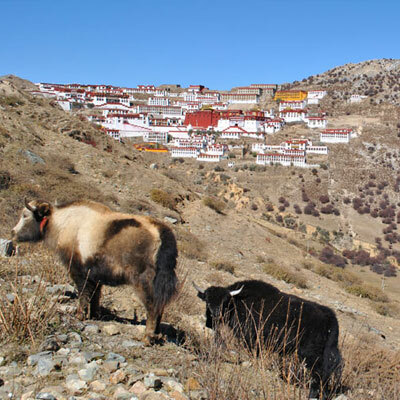 You will experience the numerous destroyed and revitalized monasteries that inhabit this high altitude area. It is a historic and moving sight. Now, the Everest base camp is only one hour biking from here! Overnight at a guest house. This day is another challenging and thrilling day as you cross this amazing pass. You all will be in excellent shape by now. Obviously, it is still a feat to climb this high pass. Overnight will be spent in a tent below Shishapangma. Today is the last day which is a long yet easy ride as you ride to Kathmandu. Stay overnight at a comfortable hotel enjoying hot showers and nice beds. One night hotel in Kathmandu. Bikes, if not convenient to bring your own bike, we can provide Professional Mountain bike at a rent or you can buy a nice bike in Lhasa with negotiating price. Our website contains as much information as possible about Tibet Mountain biking tour. However, if you have any questions regarding trip, please feel free to contact us. We answer all enquiries within 24 hours. If you want to book a trip, you can send us an email or contact us directly by phone: 0977 98510 36844 (Ram Kumar Adhikari).